If you’ve seen a backyard duck operation, you’ve probably seen the Pekin domestic duck breed even if you didn’t know what it is called. As the most popular duck breed in North America, this white duck breed is quite ubiquitous among those raising ducks in their backyard. Pekin ducks make very good market birds for their meat, but are not as well suited for duck egg laying. Male Pekin ducks can weigh as heavy as 9 pounds, while female Pekin ducks follow at 8 pounds. Pekin Ducks are used primarily for both duck egg production and duck meat production. The first Pekin duck was bred from a descendant of the Mallard duck in China, hence the name “Pekin.” The first U.S. variety of the Pekin duck arrived in the late 1800s in New York. 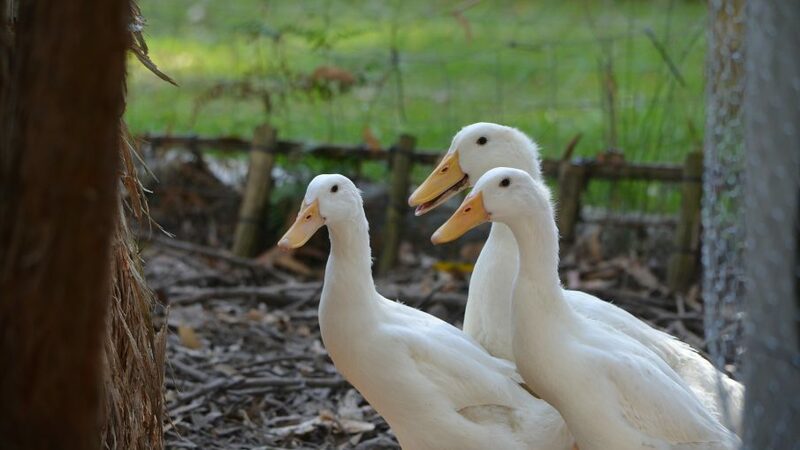 Raising the Pekin duck breed is especially popular in the commercial duck world where it is primarily used for . A large majority (some estimates say more than 90%) of duck meat eaten in the U.S. comes from commercially-raised Pekin ducks. The Pekin breed’s recognition was carried out by the American Poultry Association (APA). Raising and Caring for Pekin Ducks: Pekins can weight as much as 10 pounds and can live as long as 11 years. Pekin ducks can eat regular duck feed. Pekin ducks have white plumage and can lay as much as 200 eggs a year, or more. If you wish to brood and hatch white Pekin ducks, it takes 28 days to hatch the average Pekin duck’s eggs. You may need to use an artificial incubator and brooder as the “broody” trait has mostly been bred out of the Pekin breed. Pekin ducks do not fly. Other information about hatching fertile Pekin duck eggs can be gathered in our hatching duck eggs article. If you’re looking for another type of duck breed, consult DuckHobby.com‘s free list of duck breeds. Alternatively, consult All Breeds of Poultry, Origin: History: Description, Mating and Characteristics, by Frank L. Platt. Published by AMERICAN POULTRY JOURNAL, Chicago, Illinois.